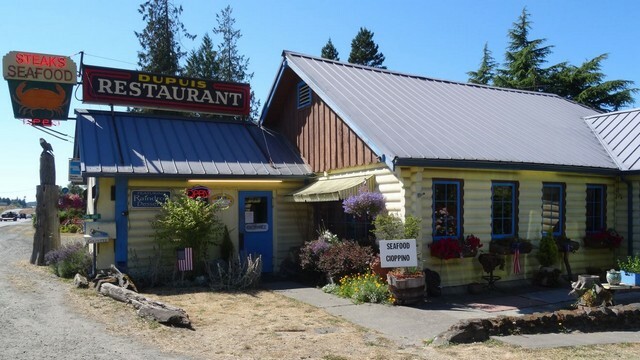 One place I always wanted to stop was the Dupois Restaurant which is between Sequim and Port Angeles. If you drive by it, you might be turned off. There is nothing special about the old building. My dad and mom used to talk about that place as if it were the best restaurant around. I always wanted to go but never did .. well, until now that is. However, we just almost never went to restaurants when we lived in Port Angeles. We didn't actually start going out to eat until we moved away from the little town. Money wasn't in abundant supplies and eating in restaurants not a priority. Dupuis is only open 4 hours a day and 4 days a week. We had to plan it right. Was it worth the planning? You bet it was. The interior is so outdated it’s downright fun. It had been a long time since we had received better service or a better meal. According to Terry it was the best oyster stew he had ever had and that's quite a compliment from him. Using his culinary skills, this chef was an artist and eating here was a dining experience in itself. With the Sequim Lavender Festival just a couple days away we noticed all the purple flags were going up on the street corners. People were flocking to town and even the annual garage sale at the Elks was starting to fill up with everything for sale. Of course, Terry was checking it all out as folks were bringing more in. He was thankful our basement wasn’t full as he looked for room to stuff the extra Mr. Heater he picked up, electric heater, table saw and certainly other stuff he didn’t tell me about. We’d been in town a week, checked out several lavender farms, been to the farmer’s market, eaten at different restaurants and were ready to head out of town since everyone else was arriving. This was moving day. First stop was at Eric’s RV service. It was time our motorhome got serviced. Plus, we had a few other things we wanted to get fixed. We were in and out of there in no time and very pleased with the service. Once finished with that it was down the road to Elwha Dam RV Park. This RV park is about 10 miles west of Port Angeles . We had even stepped out of the little box several days back and made reservations. You know we rarely do that. Yep … we had the whole thing covered. We had a reservation and it was confirmed. There was nothing to sweat about pulling into this RV park ….. or, was there? First thing we saw was an RV in our reserved site. Surely, the RV would be moving. Surely. Nope … they had screwed up the days. Not our reservation but theirs. It was actually a long story we hope to never have to experience again. The clerk assured us our batteries would hold out fine for a couple days. Hmmm … I don’t believe we reserved a dry camping spot. Leaving Duchess in a hot RV while we run around is not something we do. Terry was not a happy camper and after a few words we continued moving west for about another 50 miles. So long to the additional plans we had to kayak at Freshwater Bay, check out the Elwha Dam and explore a few more places. Perhaps, another time and another year. The stretch of Hwy 101 from Port Angeles to Forks winds around Lake Crescent. In places the lake seemed blue and then, green but one thing that was certain was the water was very clear. There were quite a few pull-outs and it was obvious other vehicles were enjoying the drive just as much as we were. All of these pull-outs are available to overnight dry camp. The view sure beats a Wal-mart parking lot. We didn’t spend the night but we did pass a little time eating lunch and walking along the shoreline. Just sitting and soaking all that beauty in and the serenity of it was amazing. Our next intended stay was at the center of Twilight activity in Forks. . We wer e certainly pleased to find plenty of room for us at the Elks in town and hookups too. Fans of the movie series, Twilight, know all about Forks. Or, they think they do. After all, isn’t that where the popular movies were filmed? Well, no is the answer to that. Forks is the town the books were written about but the movie wasn’t filmed here. The author wrote her books based on the stores, homes and schools she had seen in the little town. Of course, that doesn’t mean we didn’t want to see most of what the author had envisioned when she wrote the book. That was a fun day for sure. Then, in the evening when we were back in the RV we had visitors. A whole herd of Elk decided to visit the Elks. They were there for quite some time and just out our door. Now that was certainly an exciting viewing for us. They also seemed to be excited about viewing us! We had thought the most exciting part about visiting Forks would be visiting the “wild” Washington coast the next day. However, the Elk were definitely exciting. When we mentioned all the Elk we had seen, one of the locals in the lodge told us it was not uncommon for many more to wander on the Elks ground here. Evidently, there is a herd of between 70-80 that sometimes travel through here together. We want to see them again. We extended our stay in hopes that they come back. More about that later. July 23 - We're getting ready to move a few miles down the road. We checked out a place we really want to go but during our check-out trip, we noticed we had no cell service. We think we'll have internet because it's with a different carrier but we're really not so sure about that either. However, we'll know for sure in a few hours. So, again, you may or may not hear from me for a while. This place would have to be amazing to want to stay without cell or internet and it is! PS ... Going to Hawaii on the 5th! I would live to go to Lavender Festival. I remember your photos from last year. How can people mess up reservations so badly? I don't blame you for moving on down the road. Hawaii!!! Wow..now that is quite a road trip. We're thinking about putting the pontoons on next week. If there were dreams to sell I would buy my 19 year old body except I would take better care of it this time around. I might buy a couple bodies too. Nothing like going to a really great restaurant, good service and great food. Glad you enjoyed. Now that looks like a real Elks Lodge! Those elk are so majestic - how lovely to have them right out your window. I bet the restaurant looked the same when your folks went there :-). Glad you're following the scenery and not the signal. Safe travels. That food looks good enough to eat. Does your motorhome float? Beautiful pics of the Elks! Hope you survive o.k. if you don't have Internet service. Internet withdrawal can be mighty serious!